Candidates WILLIAM MOREBECK, LAURA PETERS, BRUCE HERRING, and CHRIS BIERWAGEN then responded to questions presented by moderator FRAN COLE at this very-well attended and organized debate. Present director Bill MOREBECK recited the history of development of the NID including the Yuba Bear project which created hydraulic power with dams on the Rollins and Scott Flat lakes. Laura PETERS, a civil engineer who has worked with water resources for 26 years, acknowledged that critical decisions will have to be made regarding major water supply projects that will require 21stcentury thinking. She cited three areas of concern: 1. Dealing with the aging infrastructure which will require good analysis and implementation to maintain and sustain the system; 2. Public credibility which requires open and transparent discussions that engage with and address public concerns; and 3. Determining if we want the Centennial Dam. Bruce HERRING has lived here for 30 years and has a background in education and management. He agrees that the NID must be open and transparent and welcome community involvement, but thought fiscal responsibility, efficiency and a healthy watershed are important concerns. “The government taking our water is a problem. The Feds now claim 47,000 acres of water a year and the State makes demands to serve downstream and the Delta,” he said. Chris BIERWAGEN is a 4thgeneration native whose family has been living and farming 1000 acres in the Chicago Park area for 116 years and has used NID water for 93 years. His father served on the NID Board for 26 years. “Water storage, convenience, need and power generation are all important. We need adequate and secure water management, but we need to be creative. Lack of snow pack released water a month early. We need to seek alternatives for storage. We need protection of our water rights and we need to expand hydroelectric power,” he said. 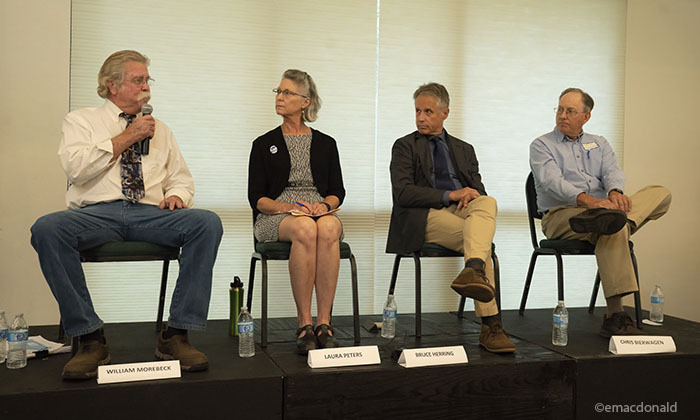 All four candidates are concerned about protecting NID water rights, including the control and sale of water, and recognize the challenge of agricultural use of water versus urban demand and state regulation. HERRING suggested teaching consumers about increased efficiency and conservation, e.g. drip systems as well as the development of more storage facilities. PETERS wants more technical assistance to farmers and low interest loans. HERRING stated, “NID needs to work with agriculture as partners rather than buyers and sellers.” BIERWAGEN thought that more incentives to conserve are needed and that partnerships with the Feds and farmers should be on a “cost/share” basis. The Centennial Dam is clearly a controversial issue. PETERS claimed that NID has unused water rights that are needed to build the dam and needs to continue to go through that process. MOREBECK countered, “There have been water rights on the Bear River for a dam since early in the 20thcentury and concerns about their best use are what is being discussed.” HERRING advised that it will take two years until the raw water master plan is complete and then it goes to the State Board. BIERWAGEN is in favor of the dam and thinks we can raise money for it by selling water. “The forest on the western slope consumes most of the water and aggressive thinning should take place,” he said. The cost of the dam is in dispute, although PETERS pointed out that $12 million had already been spent even though we are still asking whether we need it. “It was wrong to approach it that way. In any event, we must first find out how much water we need,” she said. A debate ensued about the early purchase of Bear River private property and its effects, but the consensus was that it was premature. However MORBECK countered that the landowners came to NID (not NID to them) and that NID was presently renting out nine houses that these owners wanted to sell. Concerning how the dam should be funded: MOREBECK thinks that we might be able to get Federal and State funds but mostly NID constituents will pay. PETERS also thinks that NID customers will pay and that is why it is essential that they know the facts. HERRING pointed out that even an increasing population near Lincoln won’t fund the dam and that NID will have to sell water to the South Valley and cities. He thinks that the benefit of the dam is negligible. Of course, the controversial issue about NID transparency was discussed. MOREBECK, who serves on the board, asserted that NID is in compliance with the Brown Act and that some meetings that had to take place behind closed doors may have been misinterpreted. “We are transparent and one of few boards to have live streaming of our meetings. We welcome open meetings and public input. In fact I want both board and committee meetings open to the public,” he said. PETERS thinks the meetings should be more inclusive, diverse and communicative. HERRING said, “We need to bring all voices to the table to make more informed decisions. We need more community involvement as well as partnership with U.C., the Forest Service and Hydrologists.” BIERWAGEN believes that NID is transparent, but nevertheless the public remains uninformed about NID water management. All agreed that NID needs to do more to educate all affected. Regarding the use of herbicides, all agreed that is was a serious and complex issue which must be addressed by finding and using non-carcinogenic product to treat algae and other problems. A citizens working group is looking into it and NID has hired expert consultants. PETERS, HERRING and BIERWAGEN all thought that properly managed sales of surplus water at increased cost to outsiders are appropriate. MOREBECK disagreed. He noted that NID had never sold water out of the district and thinks it shouldn’t. “That’s one of the reasons I am opposed to the Centennial Dam,” he said. Concerning climate change, most agreed that science-based and flexible policies need to be put in place to address this new normal, but BIERWAGEN noted that the area has always had periodic droughts and that it is still unclear whether this will be a trend. “Water is a precious resource, don’t take it for granted,” said PETERS. All also agreed that it was a complicated problem. Each candidate brings abundant, distinct experience, and thankfully each wants to put it to good use on the NID board.